Cynthia was able to make a connection with Mave and that fostered the beginning of a bridge that would lead to receiving professional health care. We can often be confronted with barriers from the women themselves to their family members, friends or other people of importance. When Mave’s sister, Meg, states it is the “scourge of the bladder” and she only needs some marshmallow herb for treatment, our first reaction is that she is not educated or not familiar with modern treatments. It is interesting because marshmallow (Althaea officinalis L.) actually does have antibacterial and anti-inflammatory properties — and was used for (among other things) urinary complaints. However, our instant reaction is usually to win them over to our ‘modern’ or current treatment regimens rather than finding out what their belief is, why they want to use that, or if it is safe for them to continue. Mave needed to go to the clinic and to be examined, and she needed to be evaluated for any potential risks. We are lucky that we have more technology today, which can be used appropriately when needed. The confrontation when Trixie and Sister Bernadette arrived at the birth was also very interesting. Mave was in the birthing chair, and Trixie stated, “We are in the 1950s not the 15th century.” Mave did need to lie down to be examined, but at that point it was unclear that there were twins, that the position of the second twin was not head down, and that she would experience a postpartum hemorrhage. For low-risk women we do use birthing chairs or help women to be more in a more upright position for their births! So some things that were used in the past are being used again. I was struck by the expertise of Sister Bernadette as she successfully did an external cephalic version — turned the baby from transverse, or sideways, to the head down position. 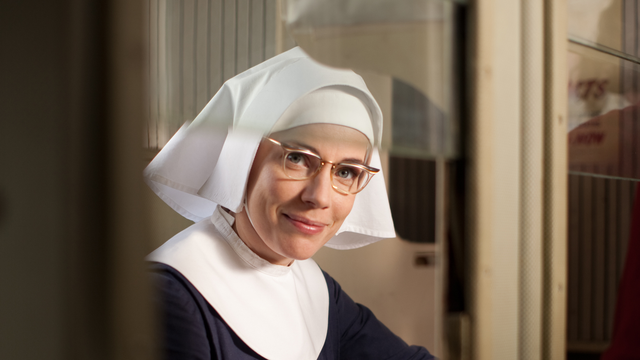 There was true camaraderie and respect between the physician and this nun. He is present — but only assists when needed. This same respect, open communication and the desire to be a team were missing for poor Jenny when she was in the hospital setting. It emphasizes the need for those elements for better outcomes for patients and even for job satisfaction! It was beautiful when Mave and Meg were reunited during the birth of the second twin — it calmed her and decreased her stress and increased her ability and strength. Jenny’s comments or reflection at the conclusion of the show are powerful, reminding me how I feel honored to be a CNM and to assist women and their families through this amazing birth process. I agree with Jenny: They step into the future, they are stronger than before, woven anew, and that their joy is increased. In order to gain trust, try to be like the nuns and the nurses/ midwives in the story. Try to explore fear and to reach past anger and get at the root of what is going on. This will build a stronger relationship, enhance teamwork and ultimately empower the birthing woman. Be open, listen and try to be non-judgmental. Explore health-care beliefs of the individual woman and family. When there are things that they want to include in their care, we need to investigate. Will this harm them? If not, can we let them incorporate? Also, what is the evidence base for some of the healing practices? Some are just not familiar but possibly not harmful, while others really need to be addressed and we need to educate people as to why we want them to avoid them. I really enjoyed this episode, and I found it made me think! There are some really interesting resources below from the National Center for Complementary and Alternative Medicine (NCCAM) website (Time to Talk campaign) and websites we have explored in our University of Michigan Nurse Midwifery clinical conferences about culture and diversity. NCCAM What’s in the Bottle? Real Life or Call the Midwife?